Ceiling too high? Swing too short? This complete swing hardware kit allows you to easily raise, lower and rotate any single point suspension therapy swing. Attaches in minutes to any pre-fixed ceiling bolt or suspension device. 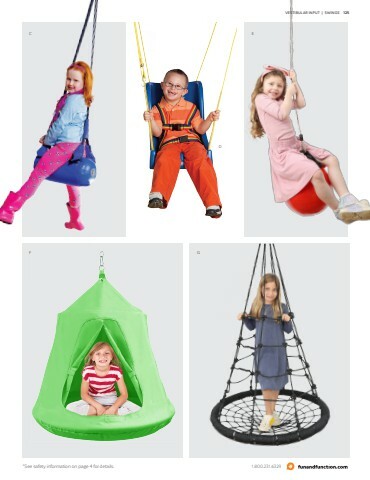 Includes one Swivel Device (enables rotation so swings can spin); two low-noise carabiners (attach to either end of swivel); one 10’ Therapy Rope with Eye Splice (changes swing height); and one Height Adjuster (attaches to rope to raise and lower your swing). Save when you purchase the complete system. All items available for individual purchase. Holds up to 350 lbs. For adult use. A simple, cost effective solution to adjust your swings to the right height. These chains easily clip onto your suspension system or ceiling hooks so you can increase or decrease the swing’s height. Includes two 27”L chains that adjust in 1” incre- ments, each with a carabiner at the end. Use one chain for single point suspension and the set for 2-point suspension. Set holds up to 150 lbs. For adult use.